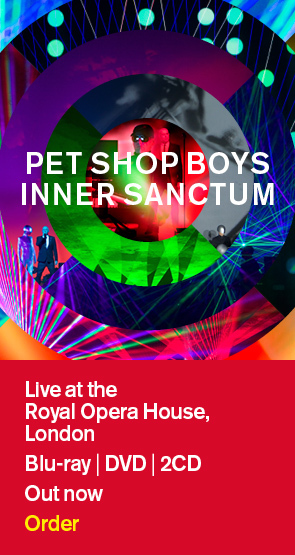 We are pleased to announce the first two UK tour dates for Pet Shop Boys' 2013 tour. Entitled "Electric", the tour will showcase PSBs' first new live stage production since the spectacular and highly acclaimed “Pandemonium” tour. “Electric” will highlight the duo’s electronic music and style and Pet Shop Boys will be working on the music with producer/DJ Stuart Price (Madonna, The Killers, Take That) who recently remixed the new single, "Memory of the future". The tour production will be created in collaboration with creative director and set designer Es Devlin (who has also worked with Take That, Lady Gaga, Kanye West & Jay Z, plus the 2012 Olympic Closing Ceremony), and stage director and choreographer Lynne Page, both of whom worked with Pet Shop Boys on the “Pandemonium” tour. The dates are: Tuesday, June 18th, 2013: The O2, London. Thursday, June 20th, 2013: Manchester Arena. Pre-sale for both shows starts this Friday, December 7th. The general on-sale for both shows is December 8th. Please see the link below. European, Japanese and both North and South American dates will be announced soon on this site. Pet Shop Boys' concert with the BBC Philharmonic and Johnny Marr is being recorded in Salford this evening and will be broadcast on BBC Radio 2 tomorrow evening, December 6th.